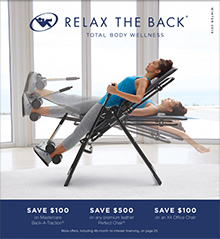 The Relax The Back store has your back covered, providing serious solutions to those seeking relief and prevention of back and neck pain. From ergonomic office chairs to cushions and massagers, you'll find cutting edge products to get your back feeling back to normal. Free Shipping will be applied automatically at checkout on the Relax The Back website.